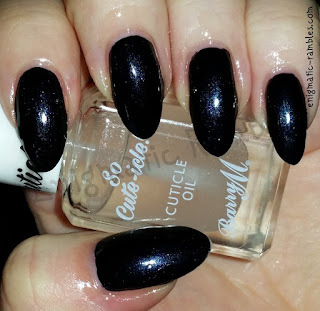 After using up my Leighton Denny Slick Tips pen I needed a new cuticle oil. As you can't see how much you have left of that pen I needed something I could buy in store, so I ended up buying Barry M's cuticle oil. This is an okay cuticle oil, I like to use it while I am sitting not really doing much as it can get everywhere.I still need to use a cuticle cream for more heavy duty moisturisation but with those they have to be used before bed as they are so intense. Not one for on the go but serves its purpose. I like it enough to use it all up and I think I would repurchase this again if it came in a different scent. After owning this and using it for some time I noticed that the formula changed, it went from a clear runny oil to a thick and chunky one. I think the reason for this is the colder weather, because as soon as it was warmed it turned back in to a smooth oil formula again. This must have a high concentration of coconut oil in it as this happens with any other branded coconut oil.